New York is what dreams are made: inspiring city streets, bright lights, towering landmarks. It’s the city that never sleeps and known as the Big Apple: it’s branding alludes to a grandness that presents a world of possibilities. It’s a pilar in popular culture with countless TV shows and movies filming within the city, and a must-visit on any North American travel list. 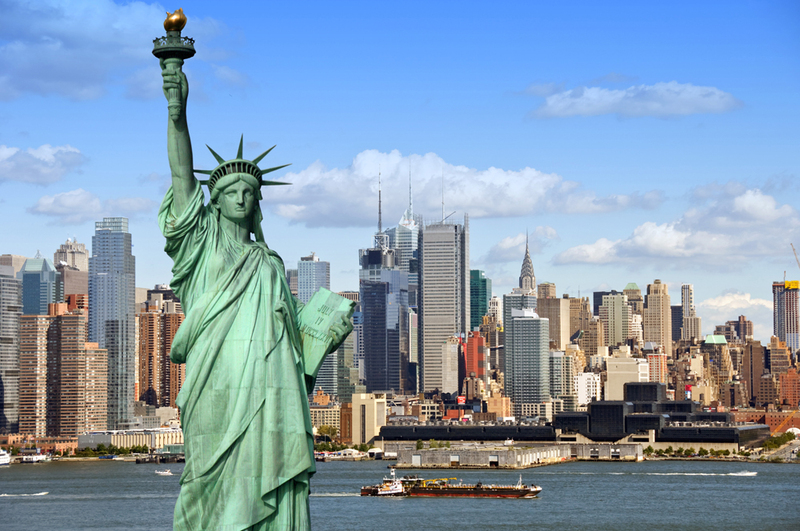 New York City tourist attractions are endless and offer enough to do for any length of vacation. The city is full of shopping, restaurants, entertainment and nightlife that keep the city loud through the night, and an elaborate subway station making every corner accessible. You’ll be introduced to the real meaning of a New York minute here, where things can happen in an instant and a second standing in the middle of the action can have you dreaming of NYC forever. This iconic city has something for everyone: foodies, history buffs, fashionistas, art lovers, nature enthusiasts, shopaholics, pop culturists, you name it. This culinary capital offers fine dining at world-renowned restaurants, a gourmet food truck scene, and everything in between. Shopaholics can indulge in the affordable stores of SoHo, ten floors of shopping at Macy’s Herald Square Flagship Store, and luxurious haute-couture boutiques on Fifth and Madison Avenues. Art lovers can visit the important sights of iconic artists, like Strawberry Fields and Andy Warhol’s famous factory locations. The renowned theatres of Broadway are popular attractions, but the city boasts everything from opera to rock shows and ballet to burlesque. If you, like the city, choose to never sleep, there is an abundance of nightlife options. Find yourself in different places and immersed in different cultures, without ever leaving the city. Browse the crowded shops of Chinatown, taste your way through Little Italy, and wander through the cobblestone streets of Greenwich Village. And, if you want to just relax on your vacation, people watching in Times Square, a stroll through Central Park, or a visit to a world-renowned spa are great options. 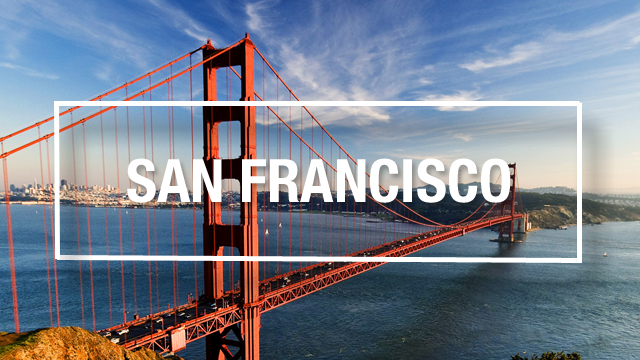 It’s never been more true to say that a city truly has something for everyone. Times Square: One of the world’s busiest tourist attractions, this is where the magic happens. Drawing about 50-million visitors annually, this busy intersection in Midtown Manhattan is sometimes referred to as The Center of the Universe and is the city’s major entertainment center, home to the annual New Years’ Eve ball drop and buskers showcasing their talent. Walk around the Square to sightsee – keep your eyes peeled for the Naked Cowboy, countless characters (like Spiderman) in dress-up, and take in the sights, Broadway signs, flashing advertisements, and street food. Statue of Liberty and Staten Island Ferry: The iconic New York tourist attraction and monument the Statue of Liberty is located on Liberty Island, but a popular way to see it is from the Staten Island Ferry which connects St. George on Staten Island and Whitehall Street in lower Manhattan. A New York Harbour ferry tour is also another popular option to get a better look at Lady Liberty. 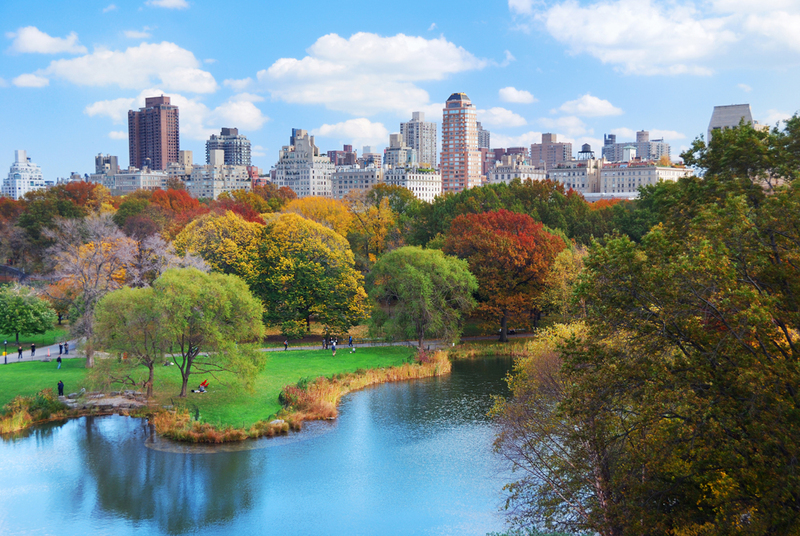 Central Park: Initially opened in 1957, this 843-acre park is home to ponds, gardens, fountains, bridges, ravines, and other areas to explore (and it’s free!). Take a tour or discover attractions like Central Park Zoo, Strawberry Fields, and Shakespeare Garden independently. A stroll through the park, or plan to visit one of the New York City attractions within the park is the perfect way to beat the heat in the city, step away from the skyscrapers, and slow down the busy pace of New York life. Empire State Building: This world-famous building has 86 and 102 floor observation areas to enjoy views of the city and the State Grill and Bar offering breakfast, lunch and dinner. You can purchase admission tickets in advance with an upgrade to skip the line during peak times. Whether you take in the view from the top, or just look way (way!) up, this is a New York City tourist attraction that definitely needs to make your list. Grand Central Station: Home to shops, dining, and a market, this building is architecturally stunning and a great place to simply take a seat and soak it all in. Following its official opening in 1913, the terminal has become an area to display art, gather, and host tournaments and performances. Wall Street: See the home of the world’s two largest stock exchanges in the Financial District of lower Manhattan. Ground Zero: Pay your respects at the humbling spot of ground zero and even take a World Trade Center Walking Tour to learn more about that day and experience the humanity of New York City. Manhattan Chinatown: Feast on authentic Chinese food, purchase some souvenirs, and walk the busy streets to soak up the scents, sounds, and sights of this thriving neighbourhood. Greenwich Village: This hip bohemian neighbourhood is known for its support of LGBT communities and ’60s counterculture movements. SoHo: This artistic district is home to many artists’ lofts and galleries as well as unique shops, restaurants, and historic buildings, museums, and theatres. New York City has no shortage of museums or galleries, for the traveller looking to dive into art and culture and learning while on vacation in the big city. For art galleries, visit the Museum of Modern Art (MoMA), the Museum of Art (the Met) or the Guggenheim to admire famous works like those of Andy Warhol, van Gogh, and Monet. The Museum of Natural History is the most famous of the museums in NYC, offering exhibits on science, the human body, places around the world, and more. Plan to spend several hours here, or a full day if you’re an avid museum-visitor and want to see the full exhibits. Adult entrance fees start at $23 while children’s start at $13, depending on the number of exhibits and special events you plan to explore and take part in. Other popular museums include the Jewish Museum, the National September 11 Memorial + Museum, New York Transit Museum, Madame Tussauds, and the New York Public Library. New York City has teams in every major sport, making the city a popular tourist attraction for sporting events and popular games. Many games are played at Madison Square Gardens, in mid-town, not far from Penn Station, while Yankee Stadium (baseball) is just off Manhattan Island. Theatre-goers will find their match on the infamous strip of Broadway Ave. Watch in awe as actors hit the stage on Broadway (find tickets for theatre, shows, and musicals here) and make you laugh, cry, or sing along. 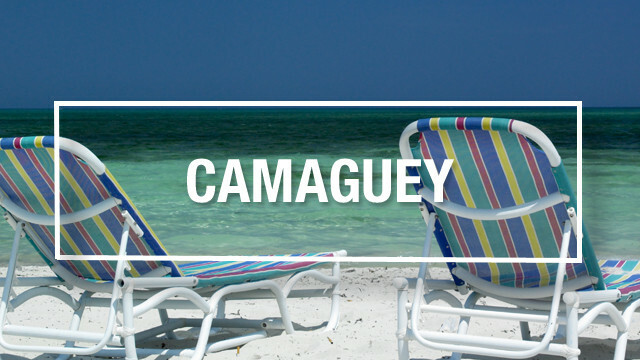 You’ll also find movie theatres, recording studios, restaurants, hotels, and other entertainment here. 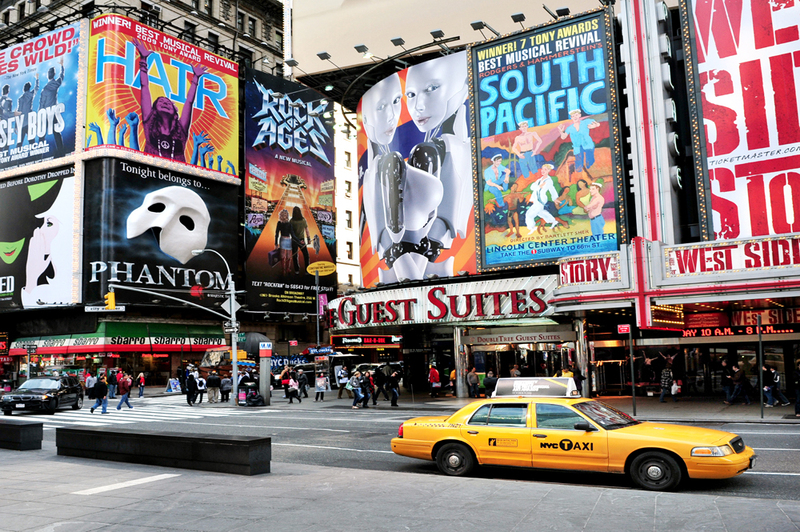 Some world-famous Broadway shows you can catch in NYC include favourites like the The Lion King, Wicked, Phantom of the Opera, Jersey Boys, Les Miserables, Chicago, and many more. Tickets range from $100 and $230. If you want discounted tickets of 25-50 percent, you can line up in Times Square for same-day show tickets. You will typically have to wait over an hour and may not get your first choice. Some of the big shows offer standing-room tickets for around $25 at the theatre’s box office just before the show. Off Broadway shows range from $15-$60. If you are visiting the city to see a specific show, we suggest you book in advance to reserve your spot. There is no shortage of comedy shows, concerts and special events, and sporting events in the city as well. *Great Value: With a New York CityPASS, you get tickets to the Empire State Building, American Museum of Natural History, MoMA, Top of the Rock Observation Deck or Guggenheim Museum, Statue of Liberty & Ellis Island or Circle Line Sightseeing Cruises, 9/11 Memorial & Museum or Intrepid Sea, Air & Space Museum. First-time visitors spend most of their vacation in Manhattan, though there are many reasons to venture out to other boroughs as well. The best way to explore the city is to walk its streets. 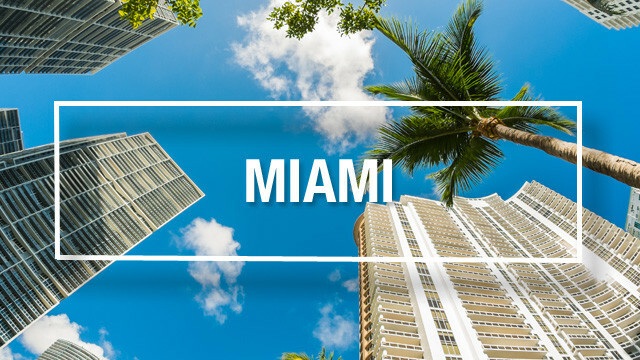 Choose to drive or fly to the city and arrive to your hotel (airport transfers are available if needed), or book a New York vacation package where your flight and hotel reservation is included in one price. Some people also opt for coach tours where they drive as a group and have specific meeting times for activities or transportation. 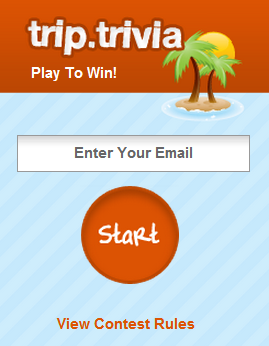 Your travel agent can help you develop custom itineraries with air, hotel, tours, and attraction tickets. No matter how many times you’ve visited, you’ll always discover something you’ve yet to uncover. This is why NYC is a favourite destination for people to return to time and time again. New York City is a popular destination in spring and summer months when the weather is warm for walking and exploring the city, but winter and Christmas and New Year’s are also popular times for special events. January sees an average low of -3C and July sees temperatures around 30C. A visit to New York City involves lots of walking; bring comfortable footwear, and plan your itinerary around city blocks and neighbourhoods. Though walkable, those wary of physical activity can still comfortably visit with planning. Subway: Transit runs in all five boroughs. There are 24 subway lines and 468 stations. Purchase a MetroCard to load with money and swipe this to get on the subway. The cost for a single ride ticket is $2.75, sold at vending machines. A 7-day unlimited pass is $31. The New York subway is a cultural staple – used every day by locals commuting to work and tourists – making the transportation both reliable and safe. You can also take a New York City Hop-on Hop-off Tour and choose from a 24-, 48-, or 72-hour tickets, perfect for first-time visitors who want to get acquainted with the city. Multiple departure times and locations are available. John F. Kennedy International Airport (JFK), LaGuardia Airport (LGA) in Queens, and Newark Airport (EWR) in New Jersey are the city’s main airports. 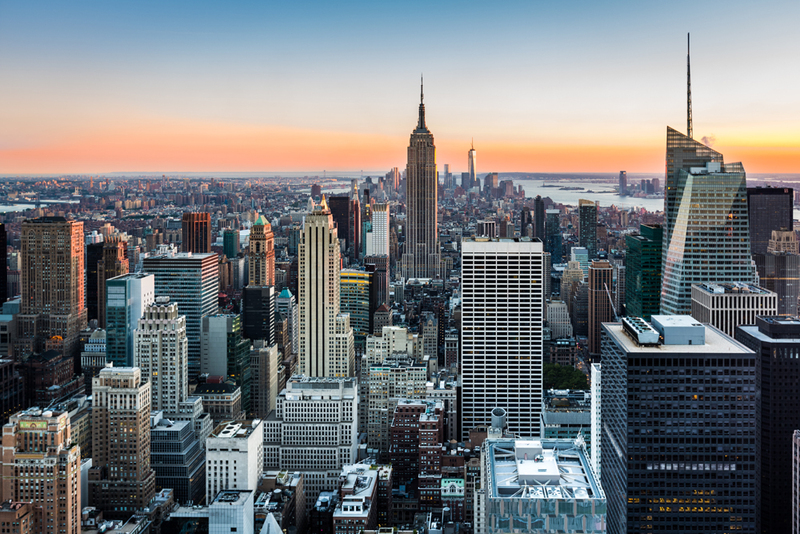 Toronto, Montreal, and Ottawa offer multiple daily, non-stop flights to New York City. Connecting flights are offered from Western Canada and the East Coast (though Halifax offers direct flights). JFK primarily handles international flights. From the airport, take the 24-hour AirTrain that connects with the MTA New York City subways and buses. Taking the AirTrain and MTA Subways to Midtown, Lower, and Upper Manhattan costs $7.75 and takes 50-75 minutes, depending on the area you wish you disembark. From Newark Airport, take a $5.50 AirTrain to connect with NJTransit. The Newark Airport Express bus is $16 one way to NYC (stops at Grand Central Station, Bryant Park, Port Authority Bus Terminal). 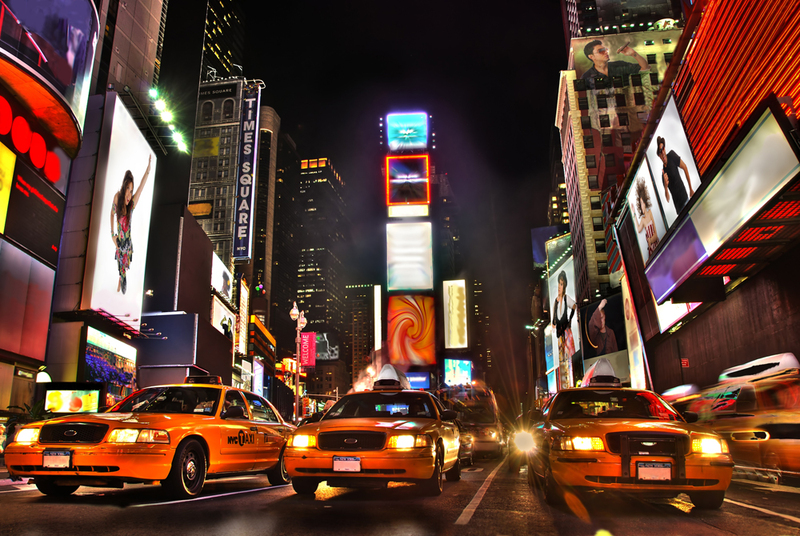 A taxi from airport to Manhattan ranges from $50-70 depending on your desired drop off location. Tip: Plan to arrive into New York City to avoid rush hour and weekend traffic for a quicker transfer time into Manhattan. Private transfers are available to book in advance, though more expensive than taxis, can be advantageous during peak times when taxi lines can be long.